Two of my husband’s favorite things: lemon and pie. Another, more recent favorite thing: ease of eating. See, my husband decided to get braces last fall. I didn’t endure that particular hell as a teenager (I had other hells instead), so it’s been rather educational to see everything he has to endure–sore teeth, broken wires, and just overall trickiness with choosing food to eat. He needs things that won’t get stuck between his teeth and that he can easily eat with a fork or spoon. He had to go get his monthly dental tweaking done, so I decided to surprise him. He was absolutely delighted with this pie. 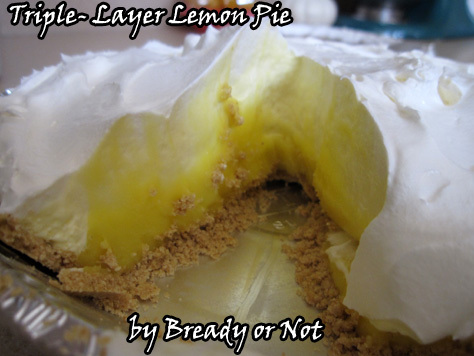 It’s cold and soothing, lemony and sweet, and very easy to eat. It’s really an awesome summer pie because it is cold and it’s totally no-bake. It comes together in a matter of minutes and just has to set. It also keeps well–my husband ate it slowly over five days. Whisk together pudding mixes, milk and lemon juice. It will be thick. Spread 1.5 cups onto bottom of crust. Mix half of the Cool Whip into the remaining pudding. 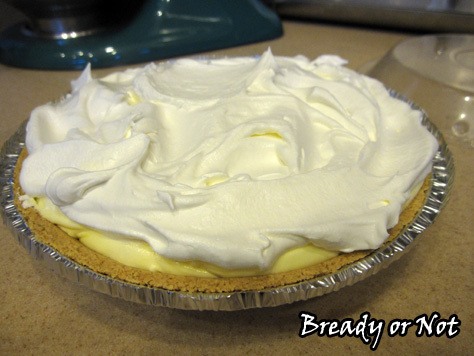 Spread the Cool Whip/pudding mixture over the pure pudding layer in crust. 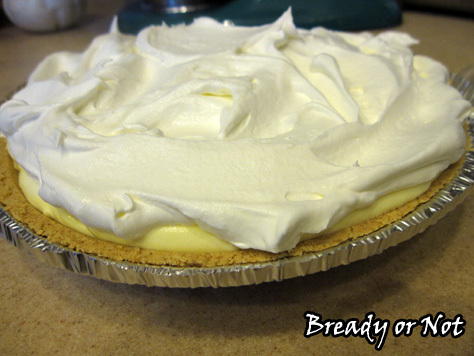 Top with remaining Cool Whip--the third layer. Refrigerate 4 hours or until firm.